Less Noise, More Green: New Zealand Spinach, will you save the day? New Zealand Spinach, will you save the day? Big Ruffles is a big disappointment. Hello, my friends! The sun is shining today and the sky is a beautiful shade of blue. Warm weather is melting the snow, at least for now, and thinking about spring plans doesn't seem quite so crazy. I will enjoy the moment. Inside, however, the gardening news is not so good. My experiment to see if I can grow spinach completely indoors over the winter has, unfortunately, taken a predictable turn. I planted two varieties - Big Ruffles and a hybrid called Melody. This week I saw the beginnings of flower formation on the Big Ruffles Spinach. Today, there is no denying it, as you can see from the photo above. After doing some more research, the only cause I can see for the bolting is the amount of time the plants are under the grow lights. Too much light can force bolting in spinach and these seedlings were getting twelve hours a day. The temperature of the room was low and the height of the lights was good, providing light but not heat. My plan now is to let the plants grow a little bit more so the leaves are big enough to eat. I will also try pinching out the flowers on a few of the plants and see what happens. Interestingly, I am seeing no signs of bolting from the hybrid variety. I'll keep going with these plants but reduce the amount of hours the grow lights are on. Melody, a hybrid variety is showing no signs of bolting - yet! I may have an alternative to traditional spinach, which is turning into quite the diva and needing way too much attention! At the URI Master Gardener Produce Donation Project, where I volunteer, I am part of the team overseeing the Demonstration Beds this year. One of the plants we are looking at growing is New Zealand Spinach. 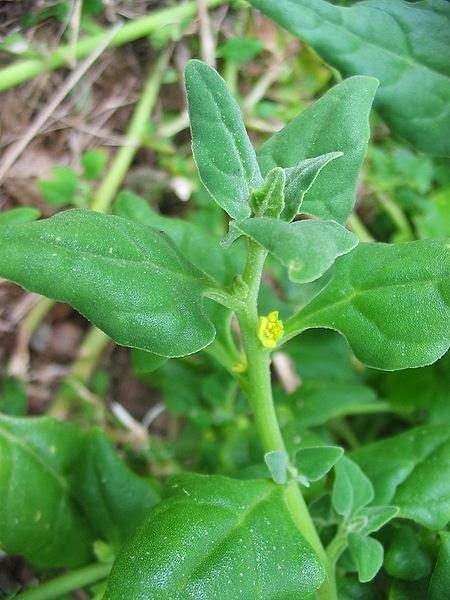 Tetragonia tetragonioides, as the name suggests is native to New Zealand, Australia and Japan and has a similar taste and texture to spinach, especially when cooked. It differs from spinach is some significant ways, however. It likes full sun and will grow throughout the summer if given some light shade. It is not prone to bolting and will tolerate dry conditions (although it prefers consistent moisture). It also likes a pretty neutral pH soil, while spinach likes alkaline soil, which is why so many of us in New England have a hard time growing it (our soil is quite acidic). It is pretty pest resistant, although I think that is because it is not a native plant to the United States! It is an annual but likes to spread so I imagine it needs some management. Young tender leaves can be eaten raw in salads, although it contains oxalates, which some people are sensitive to. Larger leaves need to be steamed or sauted which removes the oxalates. New Zealand Spinach is nutritious, being high in Vitamin A and C.
New Zealand Spinach seems like it could be a good substitute for regular spinach and addresses many of the issues I have trying to grow it in Rhode Island. At this point, I am ready to give it a try! I thought I had ordered all my seeds, but I should have known better! I ordered from Botanical Interests more packets of radishes, the New Zealand Spinach, dill (can't find my packet from last year), arugula, shiso, shelling peas and snap peas (last minute decision on this to grow at the front of the house) and more edible flowers to grow in the soil - Batchelor's Button, Poppies and Viola. Early indoor seed planting continues with geraniums and broccoli. Lavender is up next. My focus now has to shift to the front of my house. This project is giving me a head ache. I cannot decide what to do and keep changing my mind! I'll fill you in next week and hopefully get some advice! Have any of you grown New Zealand Spinach? What did you think? Have a great weekend and as always, thank you for visiting me here this week. Thanks, Yvonne, I'll definitely take a look at that!! Hi Linda, I am planning on growing Peppermint Swiss Chard this year but my family doesn't like it as much as spinach. I love it with eggs for breakfast!